In a recent blog entry I mentioned the current popularity of “live edge” furniture and my two most recently completed pieces exhibit live edge boards incorporated into the overall design of each piece (Mesquite and Cherry Gun Cabinet and A Contemporary Armoire In Mesquite and Cherry). In a future post I will give some links to other makers who specialize in live edge furniture, but for now, anyone interested in understanding better what I am talking about can go to Google or Bing Images and do a search on “live edge furniture”. One website I visited a couple of weeks ago identified its live edge tables as part of a style or trend it called urban naturalism. I did a search on “urban naturalism” and found it was a phrase that did, in deed, have coinage and resonate with a number of online writers. A brief definition could be “attempting to live a lifestyle in an urban setting that incorporates nature into one’s life”. I guess this could include anything from having a bird feeder on the back porch, to keeping a pet armadillo, to having a dining table with the natural edges left on the top. I live in the country, but still, I think I’m all for this urban naturalism and bringing more of nature into the city. I have always enjoyed using woods that have blemishes such as insect holes and spalting but it wasn’t until just a few years ago that I made my first piece that I think clearly falls into the urban natural genre, a breakfast table in mesquite and live oak. At that time a prospective client called me and asked if I would make her a small table and use a tree stump for its base. I politely declined without telling her how crude and repugnant I find these kinds of tables to be. I am a fine furniture maker, right? I hate sounding snooty but I have my standards and stump table bases fall into the same category for me as using cinder blocks or cable spools. Nowadays I can direct inquiries like this one to my friends down the road at Southwest Trading Post where they sell stumps, live edge fireplace mantle slabs, and heavy, unrefined looking farm style tables out of local mesquite and mountain juniper. The owner told me he once wanted to create nice furniture but was now making a very good living selling this other stuff. Well, God bless and more power to him. Before my caller hung up, I asked her if she would consider some alternative to using a tree stump. “Like what?”, she asked. I wasn’t sure, but I told her I would think of something and get back to her in a few days. I live in an area abundant with large live oak trees, I love to see their mushroom domed tops and gnarly twisting limbs silhouetted against an evening sky. 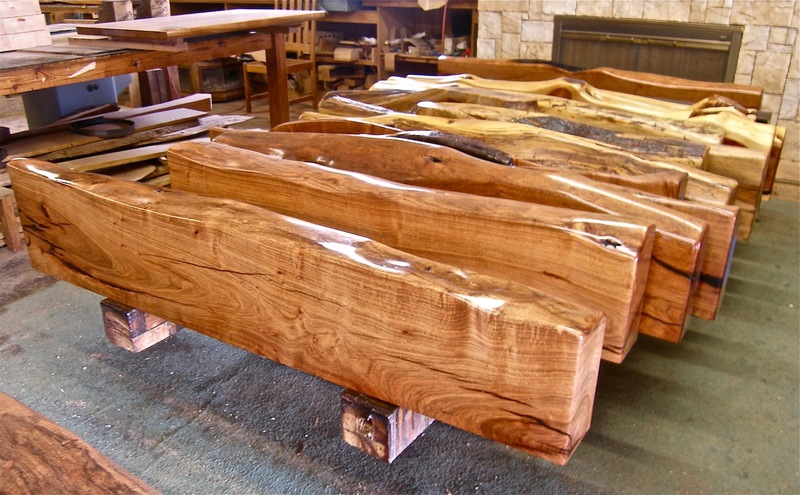 It came to me that perhaps, if I could find some dead dry beautifully shaped live oak limbs, I could compose them in a way to create a table base. How would I hold them in place to make a stable base, and how would I level a top and secure it to the limbs? I didn’t know, but I liked the general idea and these are the kinds of problems I like to solve. I got permission to hike on a couple of ranches adjacent to my own land and scoured nearly eighty acres when I came across these incredible, nature sculpted live oak roots. They had been baking in the sun for years and were hard and strong as iron itself. I emailed photos to my prospective client and got permission to commence the table. The rest, as they say, is history. The live oak roots required a great deal of sanding and polishing, but their final color and sheen made the effort well worth it. I filled cracks and insect holes in the mesquite with casting resin and ground turquoise. When I finished and delivered the table to my clients home, which was 200 miles away, I discovered that she collected fine craft. She had several other pieces of handmade furniture along with metal work, art glass, and ceramics. I was happy to see my little table had found a good home. After setting the table in place, I installed a clear piece of oval glass in the center of the top which allowed for a wonderful view of the sculptural roots below. Please visit my Furniture Gallery to see more examples of my work.